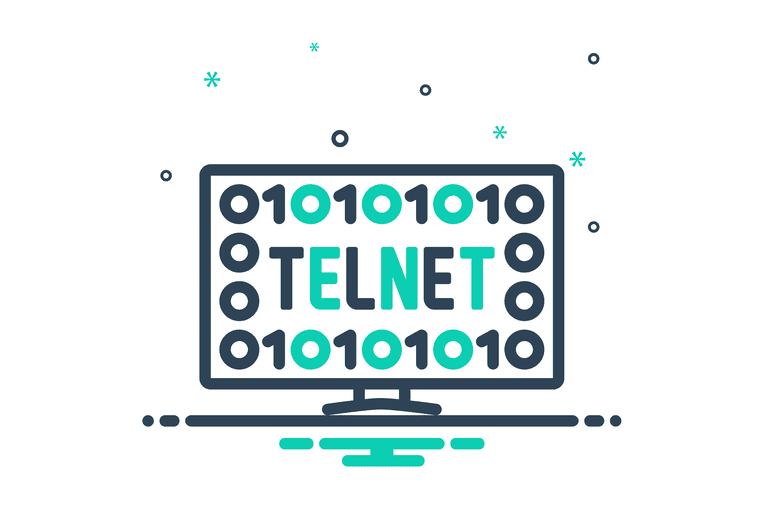 Telnet (short for TELetype NETwork) is a network protocol used to provide a command line interface for communicating with a device. Telnet is used most often for remote management but also sometimes for the initial setup for some devices, especially network hardware like switches, access points, etc. Managing files on a website is also something Telnet is sometimes used for. Telnet is sometimes written in uppercase as TELNET and may also be misspelled as Telenet. Telnet used to be used mainly on a terminal, or a "dumb" computer. These computers require only a keyboard because everything on the screen is displayed as text. There is no graphical user interface like you see with modern computers and operating systems. The terminal provides a way to remotely log on to another device, just as if you were sitting in front of it and using it like any other computer. This method of communication is, of course, done via Telnet. Nowadays, Telnet can be used from a virtual terminal, or a terminal emulator, which is essentially a modern computer that communicates with the same Telnet protocol. One example of this is the Telnet command, available from within the Command Prompt in Windows. The telnet command, unsurprisingly, is a command that uses the Telnet protocol to communicate with a remote device or system. Telnet commands can also be executed on other operating systems like Linux, Mac, and Unix, much in the same was as you would in Windows. Telnet is not the same thing as other TCP/IP protocols like HTTP, which just let you transfer files to and from a server. Instead, the Telnet protocol has you log on to a server as if you were an actual user, granting you direct control and all the same rights to files and applications as the user that you're logged in as. Although not the same as Telnet, if you're looking for a way to communicate with another computer remotely, see this list of free remote access programs. This is free software that's very secure, provides a graphical user interface that's easy to operate, and lets you control a computer as if you were sitting in front of it. Is Telnet Still Used Today? Telnet is rarely used to connect to devices or systems anymore. Most devices, even very simple ones, can now be configured and managed via web-based interfaces that are more secure and easy to use than Telnet. Telnet provides zero file transfer encryption, meaning all data transfers made over Telnet are passed around in clear text. Anyone monitoring your network traffic would be able to see both the username and password that's entered each time you log on to the Telnet server! Giving anyone listening the credentials to a server is obviously a very big problem, especially considering that the Telnet username and password could be for a user that has full, unrestricted rights to the system. When Telnet first started being used, there weren't nearly as many people on the internet, and by extension not anything near the number of hackers like we see today. While it wasn't secure even from its very inception, it didn't pose as large of a problem as it does now. These days, if a Telnet server is brought online and connected to the public internet, it's much more likely that someone will find it and wiggle their way in. The fact that Telnet is unsafe and shouldn't be used shouldn't be much of a concern to the average computer user. You'll probably never use Telnet or run across anything that requires it. Although Telnet isn't a secure way to communicate with another device, you might still find a reason or two to use it (see Telnet Games & Additional Information below). Unfortunately, you can't just open up a Command Prompt window and expect to start firing away Telnet commands. Telnet Client, the command-line tool that lets you execute Telnet commands in Windows, works in every version of Windows, but, depending on which version of Windows you're using, you may have to enable it first. In Windows 10, Windows 8, Windows 7, and Windows Vista, you'll need to have Telnet Client turned on in Windows Features in Control Panel before any Telnet commands can be executed. Telnet Client is already installed and ready to use out of the box in both Windows XP and Windows 98. Open Control Panel. A super quick way to do this is to search the Start menu for control panel or execute control in the Run dialog box (WIN+R). Select Program from the list of category items. If you see lots of applet icons instead, choose Programs and Features and then skip down to Step 4. Click or tap Programs and Features. Click/tap Turn Windows features on or off from the left side of the window. Tick the box next to Telnet Client. Select OK to enable Telnet. You might have to wait several seconds or a few minutes at most. When you see the message "Windows completed the requested changes." close the Windows Features window and the Programs and Features window. Telnet commands are very easy to execute. After opening Command Prompt, just type out and enter the word telnet. The result is a line that says "Microsoft Telnet>", which is where Telnet commands are entered. Even easier, especially if you don't plan on following up your first Telnet command with a number of additional ones, you can just type telnet followed by any Telnet command, like you'll see in most of our examples below. One example would be launching Command Prompt and executing telnet textmmode.com 23. This would connect you to textmmode.com on port 23 using Telnet. The last portion of the command is used for the Telnet port number but is only necessary to specify if it's not the default port of 23. For example, entering telnet textmmode.com 23 is the same as running the command telnet textmmode.com, but not the same as telnet textmmode.com 95, which would connect to that same server but this time on port number 95. Microsoft keeps this list of Telnet commands if you'd like to learn more about how to do things like open and close a Telnet connection, display the Telnet Client settings, etc. There is no default Telnet password or username because Telnet is simply a means which someone can use to log on to a Telnet server. There's no default Telnet password any more than there's a default Windows password. There are a number of Command Prompt tricks you can perform using Telnet. Some of them are pretty useless considering it's all in text form, but you may have fun with them. Believe it or not, you can even use Telnet to talk to an artificially intelligent psychotherapist named Eliza. After connecting to Telehack with the command from below, enter eliza when asked to choose one of the listed commands. Beyond these fun little things that you can do in Telnet are a number of Bulletin Board Systems. A BBS is a server that lets you do things like message other users, view news, share files, and more. Telnet BBS Guide has hundreds of these servers listed out for you that you can connect to via Telnet.